Dr Khalid Zaheer is an Islamic scholar and academic. He has a Ph.D. from the University of Wales. His Ph.D. thesis was a critique on Islamic Banking. Dr Kahlid also had an intensive formal religious education in Islam. He studied Quran from Dr. Israr Ahmed, Mawlana Amin Ahsan Islahi, and Javed Ahmed Ghamdi. He also went through a formal two years course on Arabic and Islamic learning from Al-Mawrid, in 1983-84. 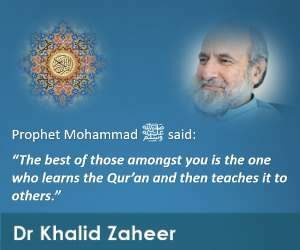 Dr. Khalid Zaheer has a deep and incisive understanding of the very relevant issue of Islam and modernity and has taught courses on Islamic ethics, traditions and economics etc. at various top national institutions, including the Aga Khan University, Lahore University of Management Sciences (LUMS), University of Central Punjab, Hailey College of Commerce, information Technology University, and Institute of Art and Culture. Dr Khalid Zaheer has also delivered various lectures on Islam in UK, Canada, Australia, Malaysia, Japan and many prestigious institutions of Pakistan. Including Civil Services Academy, Administrative Staff College and PAF War College.